Suspected militants have blown up a pipeline in Nigeria’s southern delta region, the military and locals said Tuesday, the latest in a string of attacks on oil facilities that have hit production. 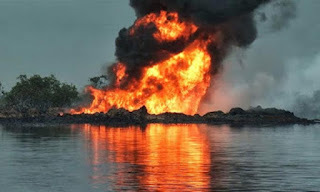 A military officer said the attacks happened at about 10:00 pm on Monday in the Batan and Makarava areas of Delta State. “The Monday night attack was an oil well head located at Makarava community” he said, asking for his name to be withheld. The chairman of the Batan community, Ogugu Dickson, added: “We heard three blasts at about 10:00 pm last night and this morning (Tuesday) we sent out the pipeline surveillance team to go and confirm details of the incident. The NPDC is a subsidiary of Nigeria’s state-run oil firm the NNPC and is involved in oil and gas exploration and production. Militants from the Niger Delta Avengers have previously used Twitter to claim responsibility but their account @NDAvengers was marked as suspended. The group said on Sunday it had sabotaged an NNPC pipeline, two belonging to the NPDC and two Chevron-operated oil wells in Delta state over the weekend. The attacks broke a relative lull in violence in the delta region that has hit production, exacerbating a wider financial crisis in Nigeria caused by low global oil prices. Nigeria’s government has made moves to end the attacks, including a reported ceasefire, although the rebels denied being party to it. The resumption of violence has been prompted by a combination of factors, including dire poverty in the region and the end of a government amnesty programme for former militants active in the 2000s.